It is late fall, and Christmas will be here any day. I haven’t gone fishing in over a month, and conditions will not be ideal again until the end of April. I am caught up in the holiday hustle, and haven’t had a second to think about time by the water. It’s going to be a long winter. It always is when you are antsy to go fishing.My friends and I send each other fishing memes and reports of other friends who have had scant luck on the water. I start thinking about new lures I could invent, or modifications I could make to existing gear. We are all fidgety and longing for our favorite pastime. This is when I try to get around to organizing my scattered melee of tackle left over from the last season. By now there are freshwater lures in my saltwater tackle box. Basic essentials like hooks and split shot weights are elusive. There is probably a Slim Jim wrapper in my freshwater bag. All of my gear is in utter shambles. Still, I ponder the possibilities of casting a line. Most stillwater will be frozen soon. I could head to a river or to areas just above or below dams. In the colder water, the fish become lethargic and don’t move around as much, so if I find an opening in the ice and can manage to cast into it, I’ll have to maneuver my bait slowly. Of all the species that I may hook up to, it seems to me, and to other fishermen I talk to, that pickerel are of the few that are biting this time of year. Ahh, the noble pickerel. They are slimy and have teeth. Most anglers think they are just plain ugly. They are not a prized fish by many peoples’ standards and most people would never think about eating one. Trout tastes amazing, striper is a delicacy, flounder has a unique texture. These are widely celebrated fish for their culinary value. Still, I have heard from a few of my less picky fishing peers that pickerel are fine table fare. When targeting pickerel, most strikes occur within 10 feet of land. They often hide in the weeds that grow on the edge of a body of water and dart out like a spear at unsuspecting prey. They are not too biased in their pursuit of food. Many fish hunt for certain prey within their habitat, while pickerel are generalists that seem to eat anything that crosses their path. This makes it easier to fish for them and might be why anglers tend to think of them as a consolation prize. Many people target bass, but catch pickerel in the process. I can see how that could be annoying. Like a pickerel, I am also a generalist. I don’t target a particular species when I fish. In fact, I most often use in-line spinners, which are one of the most versatile lures available. A day of freshwater fishing often ends with my friends catching one to four bass each, and me catching a bass, two pickerel, and a yellow perch, maybe even a sunfish. I usually leave with the higher numbers of fish to my credit, and my friends leave with a higher total of weight. Usually when I mention the prospect of eating a pickerel, most fishermen respond that they would never eat one because they are too bony. I do not doubt that, but I wonder if any of these people are speaking from experience, or just reciting what they have heard from other fishermen. I decided it was time for me to try one and find out for myself. 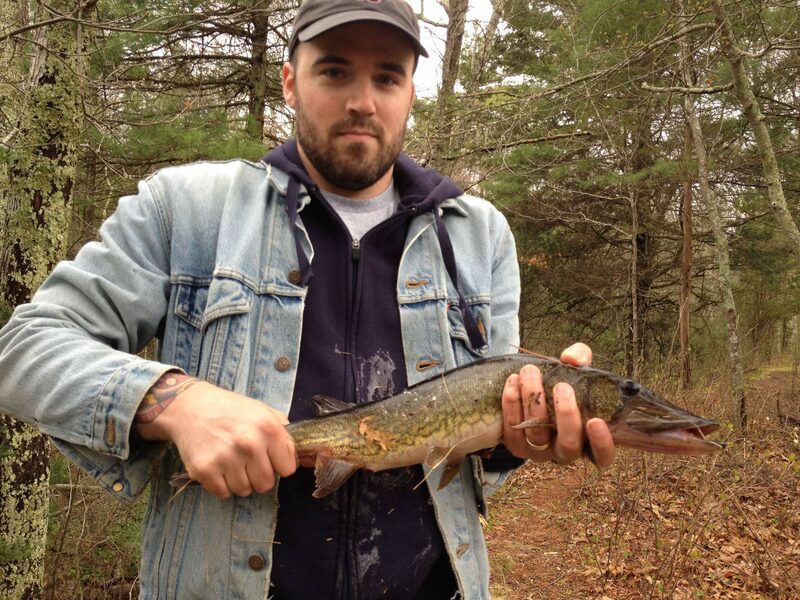 At the end of this past summer, I went to a spot in Exeter where I catch lots of pickerel. 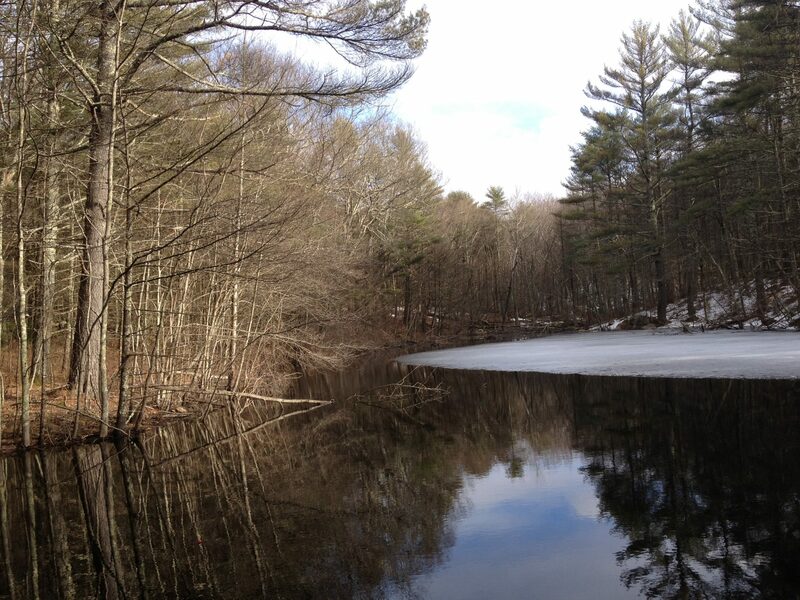 I fish there a lot and began to wonder if this little pond in the middle of the woods even holds other kinds of fish. Eventually, I caught bass and perch there and confirmed the presence of other species. Still, the majority of fish that my friends and I catch there are pickerel. I figured it was the perfect spot to accomplish my goal. I arrived with my friends Jay and Nate. As usual, I was equipped with my shiny in-line spinner. I made some casts and it was not long until I had a fish on the line. The pickerel put up a worthy fight as they always do, which is the little bit of credit bass fishermen seem to give the species. I pulled it onto land, and with nervous excitement, proclaimed that I am keeping this one. It was time to find out how a pickerel tastes. I cleaned the fish right on the edge of the water, then Jay put butter and seasoning on it and wrapped it in aluminum foil. We cooked it over a flame for about 15 minutes. I cooked the tail end with no seasoning just to see how nature intended it to taste. The fish tasted a little better than I expected, which probably had a lot to do with Jay cooking it. However, I can now tell you from experience that pickerel are bony. If you want to get out of your warm living room on your day off, and venture into the cold outdoors like the wackos I hang out with, you might want to give fishing for pickerel a try. In-line spinners are probably not your best bet in cold water though. They require fish to chase after them, which is unlikely this time of year. Buying a bucket of live shiners is probably your best bet. The clerk at the local bait shop should be happy to give you advice on where to go and what to do. You might catch a fish and be hooked (pun intended). You may find yourself wandering into the outdoors all winter long despite the cold. If you do, just remember that you chose one of the least opportune times to begin fishing, and if you can stick it out until spring, you may be rewarded with some much better fish to eat.